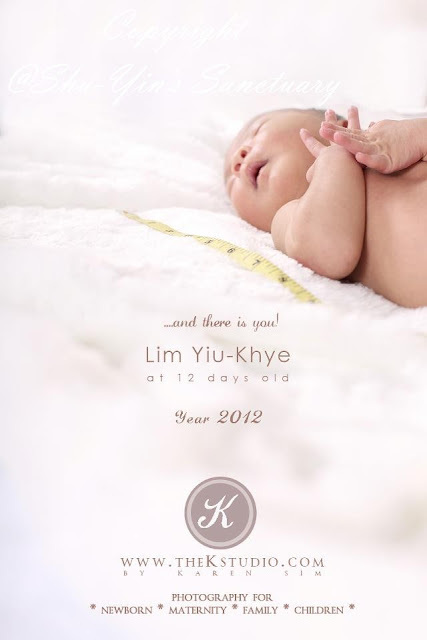 Khye's bilirubin level continued to go up. It showed a reading of 214 when we took him to the Tg Bungah gov clinic for testing on 21 Sep, Friday. The next day, we noticed Khye was more yellow. And the gov clinic is closed on weekends, so we couldn't get any bilirubin reading done. So we decided to bring Khye to Island Hospital to see Dr. Dan. Khye was then admitted to Island Hospital for phototheraphy on 22 Sep, Sat. His bilirubin reading was 256 the next day and then dropped down to 186 and then 164. He then got discharged but his reading went up again to 192 on 27 Sep, Thu. Dr. Dan did mention now that Khye is more than 10 days old, it is not harmful if jaundice level is below 250. So now we are continueing to monitor him and also to sunbathe him (praying for sun and less rain). And I pray that it is not breastmilk jaundice like his brother, in which he was yellow for more than a month. Khye poos and pees about 15 to 20 times a day. I know, coz he wears lampin during the day, and thus I could count the number of diapers he changes. His stools is golden yellow in colour, in which his peds said is a good colour, and getting him to poo more is actually good to get rid of his jaundice. But by the number of lampins need to be washed each day, I think he is doing very well. Khye is still on mummy's milk. He is like a little piranha and he latched on rather roughly at times. At the hospital, the nurses there spoon-fed him 4oz of my ebm. My little baby gobbling up 4oz of ebm......that's a big appetite for a less than 2 weeks old baby! I need to make sure my milk production can keep up with my baby's appetite. Back at home, he is on direct latch so I have no idea how much he suckles, but i assume he must have 3-4oz every time. Anyhow, as long as he seems contented after every feed, then it should be alright. Sometimes, he could not drain both my breasts, so I need to express out after his feed, and this is how I manage to store up to 20+ bottles of ebm in my freezer. We noticed Khye's little toe on his left leg was scratched when Khye was discharged from Island Hospital on 25 Sep, Tue. The next day, we noticed that his little toe was swollen. We got a little alarmed and brought him to see peds on Thursday. Dr. Dan said he had no choice but to start him on antibiotics as it was quite bad. We were told to monitor him and in case it got worse, then to bring him back on Sat. It looks OK but we still brought him back to see the peds. Dr. Dan then reassured us it is getting better and asked us to continue with the meds and to apply Fucidin cream on it. Khye has been an angel, really. He sleeps well on his own in his secure sleeper bed, and don't really need to be carried. He could just lie down there quietly by himself. At night, he sleeps well and wake up every 3-4 hourly for feed. Sometimes 2 hourly if he fuses. Overall, he sleeps well and is well rested. Khye had a photoshoot with Karen Sim from K Studio. The photo above is by her and is so pretty, I love it so much. More photos to be shared later. I am basically fine, other than a little infection on my c-sec wound. But it has been much better with antibiotic. As this confinement period is less stressful, thus I am more relaxed and I believe this is why I have more milk compared to the previous time. And coupled with breastfeeding knowledge from my experience, I am producing more milk this round. However, I am kinda feeling bored staying at home. I'm so glad 2 weeks is over. 2 more weeks to go and I'm free!